All the super powers in the world don't mean anything if you can't get behind the hero wielding them. That's a big part of why Marvel Studios is taking its time with Captain Marvel, in a quest to get that crucial portion of the project right. Carol's appeal has always been her conquering of self-doubt, and her relatable nature despite her god-like powers. She makes mistakes like the rest of the non-superpowered beings she seeks to protect, a trait she shares with some of Marvel's greatest champions. It will also be important to give her an enemy that can go toe to toe with her, with Feige says “That’s a big part of the story line we’re putting together, and it’s certainly been a big part of the development conversation." 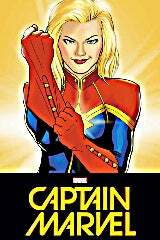 Larson will debut as Carol Danvers (Captain Marvel) in Avengers: Infinity War, but will then headline her own solo film in 2019. Marvel recently brought on directors Anna Boden and Ryan Fleck, responsible for Half Nelson and Mississippi Grind. Now that directors are in place and the lead star is already hitting the ground running, more casting news should soon follow. Captain Marvel currently has a 3.79 out of 5 on ComicBook.com's anticipation rankings.